Partners for Life: Now Let’s Bowl! “I now pronounce you partners for life,” said the Canadian justice of the peace who married Thomas Fleisher and Ken Hoffman in Toronto on May 26, 2011. And knowing that they were in a hurry, he immediately added, “Now go bowl well.” After nine years together Thomas and Ken got married at that year’s annual tournament held by IGBO, the International Gay Bowling Organization. For those who know and love them, it’s not surprising that this public declaration of their lasting love for one another would happen around a bowling tournament. With a mutual passion for bowling, their individual and shared lives have been shaped by their love of this sport. And it’s important to them that those who are dismissive of bowling as a real sport realize that the game requires athletic ability and skill just like any other sport. Ken is president of PUGBA, the Phoenix Unified Gay Bowling Alliance that encompasses seven gay leagues within the Phoenix metropolitan area, a position he’s held for multiple years. He also serves as director for PRIT, the Phoenix Regional Invitational Tournament that annually brings bowlers from across the U.S. and Canada to Phoenix for a fun-filled weekend tournament. This year PRIT has returned to its original time slot in February. Thomas enthusiastically accepts and fulfills his role as PUGBA’s first lady – and who doesn’t love a first lady who wears a kilt to bowl! If you don’t know them, it might be easy to think that they’re an unlikely couple but the fact is that they are a wonderful match. Thomas is the more outgoing of the two. Filled with entertaining and outrageous stories that can be delightfully shocking to those not familiar with the LGBTQ community, he seems like the classic extrovert. But it hides the fact that he is really very shy. It takes a bit of time for him to feel comfortable enough with someone to be totally open. And no wonder – the Minneapolis, Minnesota native experienced a coming out that wasn’t easy. His connection to bowling dates back to his childhood. Going to the bowling alley with his mother and father, Thomas recollects being six or seven and watching them bowl, especially his mother, saying “I just remember looking at her and thinking she’s awesome.” Bowling continued to be important to him as he got older. While living in a foster home he bowled every chance he got at the local YMCA, recalling that it wasn’t unusual for him to bowl ten hours non-stop. Always creative, Thomas’ bachelor’s degree in fine arts in 1989 from the Minneapolis College of Art and Design led to a wonderfully exciting international career as a commercial photographer with a principal base in Brussels, Belgium. Although he’s given up the large commercial cameras he used to use for his iPhone camera, his keen eye for composition and design are evident when looking at the pictures on his Facebook page. He hopes to have a gallery showing of his images sometime in the near future. As a quality analyst for Wells Fargo, he’s currently on Family and Medical Leave Act (FMLA) following touchy back surgery to correct damage from a prior car wreck. This also means he’s not permitted to bowl until cleared by his doctor – the term “cabin fever” immediately comes to mind! His trained photographer’s eye can also spot patterns and trends in numbers, a gift that prompted his boss to nominate him for the Wells Fargo Innovators Club Team Choice Award for 2013. He loves his job almost as much as he loves bowling. It doesn’t take much for him to talk about the job itself as well as the company and how much he appreciates the way Wells Fargo supports diversity within the company, saying that they do an incredible job. Ken is the quieter of the two but he is certainly no shrinking violet. He exudes a quiet self-confidence that sends a subtle but definite message that he’s perfectly capable of meeting any situation head on and taking charge. A native of Tillamook, Oregon, his coming out wasn’t the traumatic experience many gay people face. His mother is and always has been very openly supportive of him and she has welcomed Thomas as part of the family, as well. Always an honor student, Ken was also the student body president at his high school and received a full scholarship to college. In addition to a love of bowling, he always had an interest in business but wasn’t sure which branch he would choose. After spending two years at Whitman College, a small, private liberal arts college in Walla Walla, Washington, he spent his last two years at Oregon State University and graduated with a bachelor’s degree in business. His college studies had focused his love of business on finance and following his graduation, Ken began a banking career in Seattle. It was a new bank opportunity, however, that brought Ken to Minneapolis. And it was his love of bowling that enabled him to meet Thomas in 1999 at what else … a bowling tournament. But it wasn’t until April 7, 2002 when they had their first date – they were both single, there was undeniable chemistry and the two quickly became a couple. Thanks to their travels to the various regional, national and international bowling tournaments, they knew they wanted to live in Phoenix. Figuring that a pool to cool off in the summer heat of the desert was preferable to a warm house to escape the bitter winter cold of the north, they set a goal of moving there by July 2004. And in October of 2003 Ken accepted a job with the Internal Revenue Service’s small business division in their Phoenix office. Thomas put his Minnesota house on the market and in January of 2004 he got word that it had sold. So the closing was set for March 15. Why? Because it coincided with a bowling tournament – naturally! They got to sign the papers on their home and have a great going away party in Minnesota and still make it back to Phoenix in time to bowl in PRIT. The following year PUGBA tapped Ken to serve as director of sponsorships. It was also about this time that he decided to go back to his first love, banking. Hired by Wells Fargo, he was a vice president specializing in the areas of relationships and risk management. And like Thomas, he has nothing but praise for the way the company supports both its LGBTQ employees and the overall community. Unfortunately, his most recent position as vice president with Bank of Arizona in their corporate trust department has been eliminated, along with that of his boss. So he is splitting his time between taking care of Thomas during his convalescence, serving on the board of directors for Artists United and job hunting. It’s those business, creative and relationship skills that people like Ken, Thomas and many other dedicated bowlers bring to their organization. The IGBO bowling community is exceptionally loyal, both to the sport and to their fellow-bowlers. 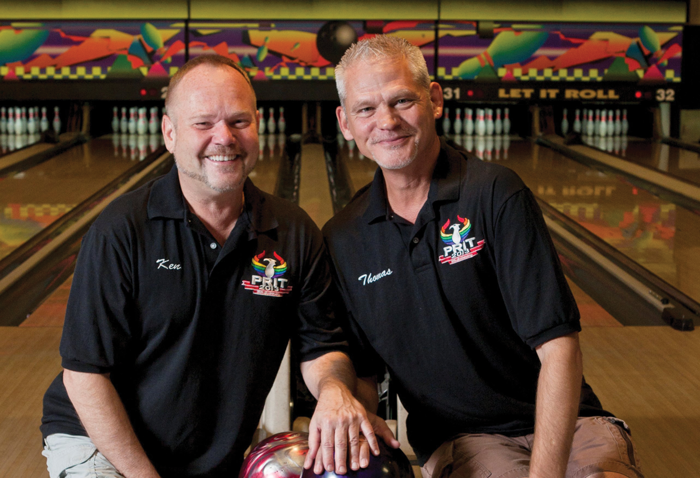 There is a core of dedicated bowlers like Thomas and Ken who not only participate in their local and regional tournaments but who also travel to many of the national and international tournaments in support of their fellow athletes. And not all those bowlers are gay – there are many straight allies who happily support the cause of diversity by their involvement with their local gay bowling leagues. In Phoenix, the mission statement for PUGBA is to “Promote and foster amateur bowling competition at the local and national level for the LGBTQ and allied community. The organization shall promote unity, communication and fellowship in all LGBTQ sport, competitions in the LGBTQ and allied community.” Ken shared that this is the first time their by-laws re-write committee emphasized the allied community. Noting that PUGBA’s vice president and PRIT co-director Tina Marie Mae is straight, Ken said that “the committee felt very strongly to be all inclusive and to specifically make sure to mention our allied or straight community.” Saying that he “couldn’t have been prouder of them for taking this to task,” he continued to say that PUGBA’s focus is now very clearly outlined as being of service to both the LGBTQ community and their allied partners. In addition to enjoying the camaraderie that is a natural part of team sports like bowling, PUGBA members enjoy supporting local community organizations, such as 1N10 and Mulligan’s Manor that provide a safe and welcoming atmosphere for LGBTQ youth. For Thomas, who ran away from home at a young age, the community support the local bowlers offer LGBTQ youth in the Phoenix area is deeply meaningful. What Is Happening with Eurogames 2019 Rome?